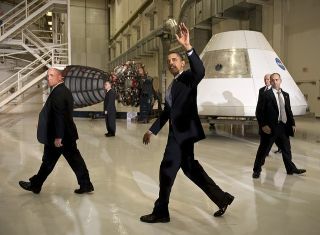 President Barack Obama waves farewell after speaking at the NASA Kennedy Space Center in Cape Canaveral, Fla. on April 15, 2010. A lot has changed in the fields of spaceflight and exploration since President Barack Obama came to power eight years ago. The moon is no longer an official destination for NASA astronauts, for example, and the commercial spaceflight industry has boomed to the point that multiple private spaceships are flying cargo to the International Space Station (ISS) — and two should soon start ferrying crew to and from the station as well. When President Obama took office in January 2009, NASA was working to get astronauts to the moon by 2020, as part of George W. Bush's Constellation program. Constellation envisioned using the moon as a stepping stone to Mars, though the program didn't map out any crewed Red Planet missions in detail. In May 2009, the Obama administration ordered an independent review of the agency's human-spaceflight plans, which came to be known as the Augustine Commission (after the review committee's chairman, former Lockheed Martin CEO Norm Augustine). The commission's final report, published in October 2009, deemed Constellation to be significantly over budget and behind schedule. As a result, in 2010, President Obama cancelled the five-year-old program, instructing NASA to instead get astronauts to a near-Earth asteroid by 2025, and then on to the vicinity of Mars by the mid-2030s. To make all this happen, the agency is developing the Orion crew capsule (a Constellation holdover) and a gigantic new rocket called the Space Launch System (SLS). NASA has also devised the Asteroid Redirect Mission (ARM), which aims to pluck a boulder off of an asteroid using a robotic probe. This spacecraft will then haul the boulder to lunar orbit, where astronauts can visit the space rock. Astronauts will fly on an Orion/SLS mission for the first time in 2021, if all goes according to plan. A crewed mission to visit the captured asteroid boulder will follow in the mid-2020s, NASA officials have said. The decision to shift from the moon to an asteroid (and, ultimately, to an asteroid boulder) as the near-term destination for NASA astronauts has been controversial. Last year, for example, the U.S. House of Representatives' Appropriations Committee proposed denying funding to ARM. The change has also made collaboration with commercial and international partners more difficult, said Scott Pace, director of the Space Policy Institute at George Washington University. NASA officials have stressed that such collaboration is a key priority of the larger "Journey to Mars" project. "Mars is so difficult and so challenging that it wasn't really possible for people to feel they could do something" in cooperation with NASA, Pace told Space.com. "You could talk about commercial cargo delivery to the moon. You couldn't really talk about commercial cargo delivery to Mars." Commercial spaceflight has taken off during the Obama presidency. For example, two different American companies, SpaceX and Orbital ATK, are now flying uncrewed resupply missions to the ISS for NASA. Such public-private cooperation kicked off with the announcement of NASA's Commercial Orbital Transportation Services program in January 2006. But it was "turbocharged" under the Obama administration, which made the development of private crew-carrying vehicles a priority, said Casey Dreier, director of space policy at the nonprofit Planetary Society. "That, to me, is the biggest legacy [of the Obama administration] — fully embracing the potential of commercial launch capabilities, and really, really making that a priority, and fighting for it against a lot of opposition from Congress," Dreier told Space.com. "I don't think commercial crew was fully funded at NASA until 2015." Other developments under Obama's watch have been key as well, said Eric Stallmer, president of the nonprofit Commercial Spaceflight Federation. He cited extending the life of the International Space Station through at least 2024 and the confirmation that U.S. companies can own the resources they mine from asteroids and other celestial objects. Both of these provisions are part of the Commercial Space Launch Competitiveness Act, which the House of Representatives passed and President Obama signed in late 2015. Lots of things are happening in private spaceflight beyond NASA-funded ISS cargo and crew missions. Blue Origin, the company founded by Amazon.com chief Jeff Bezos, has said it's nearly ready to fly paying customers to and from suborbital space, for example. Virgin Galactic is making strides toward the same goal. Some of these developments would probably have occurred no matter who was in the White House, because private spaceflight was already on the rise, Stallmer said. (More venture-capital money was invested in commercial spaceflight in 2015 than in the previous 10 years combined, he said.) But the Obama administration deserves credit for creating an environment in which such advances can take place, Stallmer added. President Obama's space-science legacy is perhaps a bit more complicated. In these tough budget times, the outgoing administration seems to have prioritized Earth science and full funding of the $8.8 billion James Webb Space Telescope over robotic-exploration missions, Dreier said. He pointed to a $300 million cut to NASA's planetary science funding in the White House's proposed budget for fiscal year 2013 as an example. The planetary-exploration cupboard therefore looks to be somewhat bare in the near future, two recently announced asteroid missions notwithstanding, Dreier said. There are no uncrewed NASA Mars missions on the books beyond the Mars 2020 rover, he pointed out, and, in a year or so, the agency won't have an active probe at Jupiter or Saturn for the first time in two decades (excepting a nine-month stretch in 2003 and 2004). The Cassini spacecraft, which has been orbiting Saturn since July 2004, will wrap up its work this September, and the Jupiter-orbiting Juno probe's mission is scheduled to end in early 2018. NASA is developing a mission to the Jovian moon Europa, but that effort's not slated to launch until the mid-2020s. "You have a generation of missions about to end and nothing ready to replace them for five to 10 years," Dreier said. But it's possible that there could have been more happening now on NASA's robotic-exploration front if the White House had cooperated to a greater extent with Congress, Dreier said. "They almost wouldn't believe that Congress was willing to give them extra money on planetary science, but year after year after year, Congress added money to planetary science, particularly in the House," he said. "I think there are a lot of lost opportunities there." Pace agreed, lamenting the lack of "new starts" in NASA's exploration pipeline. But he said the Obama administration deserves credit in some other areas, such as space defense. "Putting more money into DoD [the Department of Defense] and recognizing the Russian and Chinese counterspace threat — that's, I think, in the positive column, so I hope that continues," Pace said. "Most of the Obama space policy, I would argue, is actually quite reasonable," he added. Pace did have some major caveats, however. He's not a fan of the move away from the moon for human exploration, and he said the Obama administration employed an overly broad definition of "commercial spaceflight," resulting in some confusion about the roles the private and public sectors should play. All of the above should be taken with a large grain of salt. It will probably take years to fully assess just how the Obama administration shaped U.S. spaceflight and exploration, partly because decisions made by the Trump administration and other future officeholders will affect that legacy. Sometimes, the clarity this temporal distance provides can lead to surprising conclusions. As an example, Pace cited presidents John F. Kennedy and Richard Nixon. "I would make an argument that, actually, Nixon has had a longer-term legacy on human spaceflight," Pace said. "People remember Kennedy and going to the moon, but it's Nixon and his choices and nonchoices about [the space] shuttle in 1972 that have arguably been with us for 40 years," Pace added, referring to Nixon's decision to base NASA's human-spaceflight activities on the space shuttle program, without any distant destinations in mind. Nobody has set foot on the moon, or been anywhere beyond low-Earth orbit, since the Apollo 17 mission ended in December 1972.